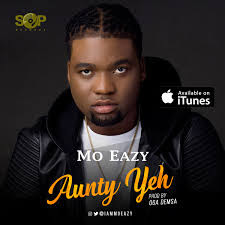 Mo Eazy has finally released the most anticipated music video for his trending single, "Aunty Yeh", a street anthem getting massive love across the nation. Mo Eazy managed to bring out the unexpectedly fun personas of some of the biggest names in the Nigerian Entertainment Industry in the video with A-List stars like Funke Akindele Bello, Ronke Oshodi-Oke, Dayo Amusa, Toke Makinwa, Moët Abebe, Kaffy, Damilola Adegbite Attoh & Chigul taking on active roles in telling the story of “Aunty Yeh”. Also starring in the thrilling video which sees two groups of ladies; Models & Vixens on one side and the Aunty Yehs engaged in a fierce dance battle to see who’s got the best moves – leaving the judges with the decision of their lives, are personalities we’ve all come to love including VJ Adams, Dj Nana, Iyabo Ojo Fespris, Lolo 1, Linda Ejiofor, Del B, Gemstones, Sonorous, Martinsfeelz to mention a few. With his unique flows on the wonderful beat by Demsa and the star power he brings in this tastefully directed video by JJCSkillz, SOP Records artist, Mo Eazy is definitely a force to be reckoned with!